Every single human being is part of a grand universal plan. Thats what my Nana always says. Were not alive just to lounge around and contemplate our umbilicus. Were metaphysical beings! Open us up, and theres more rattling around in there than just brain sacs and fatty tissue. We are full of imperceptible essences. Invisible spectrums. Patterns. Ideas. Were containers of awesome phenomena! Which is why its important to live right. You have to be attuned to whats around you, and you have to keep from clogging your receptors with crap. According to my Nana, the universe is sending signals every day, and its up to us whether or not we want to listen. We can either perk up our ears, or walk around like dead piles of dermis. I always preferred the former. Which is why I found myself up on top of the roof of our dome on that fall Sunday when everything began. Sebastian Prendergast lives with his eccentric grandmother in a geodesic dome. His homeschooling has taught him muchbut he's learned little about girls, junk food, or loud, angry music. Then fate casts Sebastian out of the dome, and he finds a different kind of tutor in Jared Whitcomb: a chain-smoking sixteen-year-old heart transplant recipient who teaches him the ways of rebellion. Together they form a punk band and plan to take the local church talent show by storm. But when his grandmother calls him back to the futurist life she has planned for him, he must decide whether to answer the callor start a future of his own. Peter Bognanni's The House of Tomorrow is a fresh and creative novel that I truly enjoyed reading... The plot of the story isn't particularly fast-paced or driving, and at times it feels slow, but [the novel] is more about the rich conversations people have while practicing musical instruments together, how sharing CDs can be a window into someone's soul and how shared situations create a deep bond between people even if they don't always treat each other right, just like Sid and Nancy. (Reviewed by Elena Spagnolie). The House of Tomorrow... inhabits a pleasant no man's land between Young Adult Fiction and Fiction About (Extremely) Young Adults. There's a long view of adolescence here, but it's also a story about going from childhood to adolescence that should appeal to any freshman lit major with his wits about him. Starred Review. [A] funny and unique debut...an honest, noisy, and raucous look at friendship and how loud music can make almost everything better. The House of Tomorrow, as its title and premise promise, marries the visionary with the everyday, the whizbang with the domestic, and does it with beauty, humor, and love for each one of its flawed characters. Peter Bognanni remembers all the romance and awkwardness of teen life and teen music. His first novel is headlong, hilarious, heartbreaking. Under the screaming rage of a Misfits or Ramones song, you can hear a heart beating, and that's where Peter Bognanni gets to work - his wild and tender book reveals how much a couple of scared boys can say to each other with a little hateful noise. I adore this book, not only for its ability to love our ludicrous hearts, but also for the way it makes dividing questions about whether good literature comes from the heart or the mind seem like nonsense. Geodesic Domes Punk Rock Bands = Wonderful, quirky coming-of-age story! 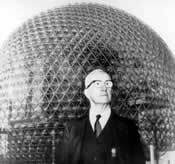 If you're not already familiar with the wildly eccentric personality of R. Buckminster Fuller when you read The House of Tomorrow, you might be tempted to think that he is a fictional character. However, Richard Buckminster Fuller was, indeed, very real. Born in 1895 in Milton, Massachusetts into the New England tradition of Transcendentalism (he was related to journalist and women's rights activist Margaret Fuller), "Bucky" grew up playing architect and was intrigued by structural design from a very young age.